There’s a crowd in the distance that’s cheering your name, your breath fogs the inside of your helmet as your ears register the loud engine of your bike that’s almost deafening. A rush of adrenaline runs through you as the whistle blows. This is Rabin Shrestha. Twenty year old Crossfire stunt artist and winner of the National Stunt Battle, here to share with ECS, the exhilarating experience of participating in his first grand stunt competition. Plus, details about his past that he’s never shared before. Share with us, one of your most memorable moments from the National Stunt Battle. Just before the show, my bike’s back brakes came up with some problems. So, I had to perform with just my front brakes. Coincidentally, in the middle of the competition, my bike broke down! Before time ran out, my friend gave me his bike and I completed the rest of my routine on it. How did you prepare for the competition before hand? I believe that it is very important to be relaxed before a competition to build focus. So, I took an early nap before the show day. It relaxed my mind and body. Have you been a part of similar competitions? 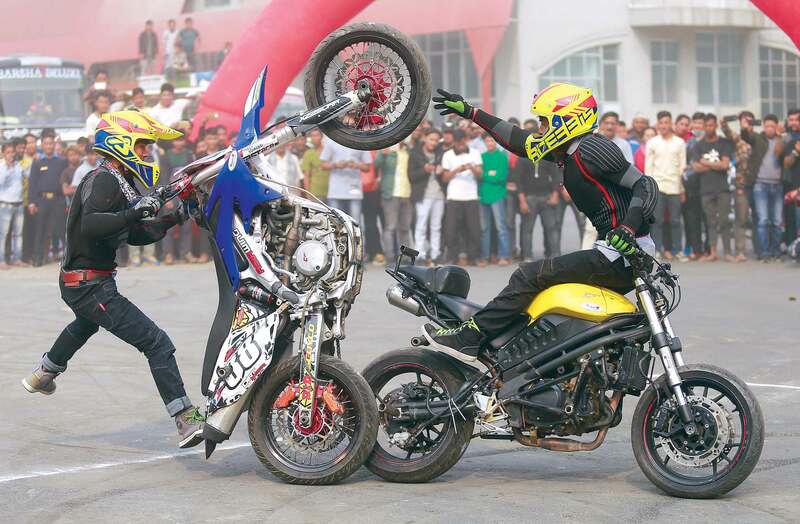 I haven’t been a part of such a big competition before, but I have performed in many stunt shows that were held in my home town, Surkhet, and various other places. Looking back, why was the National Stunt Battle important to you? When I started out in the National Stunt Battle, I was very young. The competition was a proving point for me and my family that assured that I truly was good in stunt biking. Next, the National Stunt Battle allowed me to meet and become a part of the Crossfire family, who were to sponsor me in the competition and allow me to perform in their stunt shows. So far, it's been an amazing experience for me. How different has your life become after the National Stunt Battle? Share with us any one lesson that you learnt from the competition. (Smiling) One important lesson that I learnt from the competition was that, hard work pays off! How has the National Stunt Battle shaped your career? National Stunt Battle has allowed me to build amazing connections with many bikers along the way. They are now my lifelong friends. It has also shaped my career by providing me with much needed experience. What is one of your earliest memories on the bike? One of my earliest memories of executing stunts was actually on my cycle that I used to have. Later, I used to sneak out my dad’s bike and try out some moves. It was quite fun and risky at the same time. What do you believe sets biking apart from other sports? Biking, according to me, carries extra risk in comparison to other sports. It requires much more speed, focus, and precision. What is one thing that you want to say to your fans and supporters? I think that sometimes fans and supporters say that I love this artist, but they may not realize that he loves them back! Fonzy, the character from the movie Happy Days, was one of the most famous fictional exponents of the motorcycle. Yet, in real life, Henry Wrinkler, who played Fonz, could never actually ride a bike! Earlier in the days, motorcycle helmets were lined with cork for protection. The makers of Triumph, U.K.’s most famous motorcycle brand, made golf balls in the past. American daredevil Evel Knievel was known for his death-defying stunts, but did you know that in his 1977 action film Viva Knievel, he employed a stunt double? The word ‘Vespa’ means wasp. Quite fitting, given the noise they make! Gottlieb Daimler and Wilhelm Maybach built the first motorbike in 1885 in Germany. It was called a Reitwagen. The longest motorbike ride through a tunnel of fire was made by Hou Jun in Changchun City, Jilin Province, China, on July 19, 2007. The largest parade of Harley Davidson motorbikes was conducted for charity in Denver, Colorado, on December 8, 2002, and included 2,118 riders. The largest motorbike pyramid was built in Jabalpur, India, on July 5, 2001, by the Dare Devils team of the Indian Army Signal Corps. The pyramid, consisting of 201 men balanced on 10 motorbikes, traveled 424 feet. Hou Xiaobin of Binzhou City, China, broke the record of the longest backward motorbike ride with an impressive backward 93.21 miles in 2006.